Is the thought of Valentine gift is making you very much confused? Well then it is the right time for you to make a visit at the vast catalogue of online Dry fruits with Flowers range here below. It is a vast catalogue for online Dry fruits with flowers consisting of gifting options to express care and love both in one. Love is a beautiful feeling. To celebrate this beautiful feeling of love people celebrate Valentine’s Day. It is the day for the lovers to celebrate and to feel special about being in love. But the thing that makes Valentine’s Day an exciting day for the lovers is the Valentine gift. Thus to help confused lovers who are still not getting what to gift his/her beloved to express care and love bother, here is an exclusive catalogue of Dry fruits with flowers. In the offered range of Dryfruits with flowers there are plenty of gift combos that is inclusive of amazing dryfruits pack to express care to beloved clubbed with beautiful flower bunches to express love. 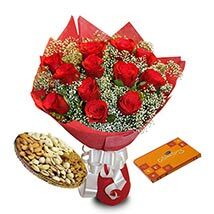 For choices there is plethora of gifting options like Best wishes for you-VL, My Best Wishes-VL, Roses with dry fruits-VL, Authentic Wishes-VL, Best wishes for you-VL, Roses with dry fruits-VL and much. In fact lovers in long distance relationship can send Dryfruits with flowers to India online.